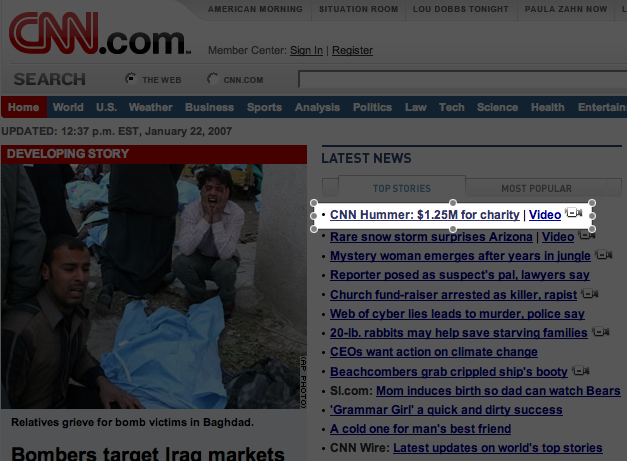 I know CNN wants the world to know about the $1.25 million it raised for charity by selling a Hummer. But why is this story the top story on their Web site STILL? I saw it there probably this time yesterday afternoon. I saw it there last night. It’s still there now. I can’t figure out why it’s still the most important story. It never really was. I thought it was my cache or something acting up, but no, the other stories are definitely different. It seems they have this one as a sticky or something at top. Is it just for the PR? I don’t know. But it’s weird. UPDATE: As of 11:48 p.m., CNN has a different top story. But guess what, the first word on that story is also CNN, as in CNN debunks false report about Obama. (And the CNN Hummer story is still in the top stories list.) Yeah. Slow news day? This entry was posted on Monday, January 22nd, 2007 at 12:48 pm	and is filed under Commentary, Journalism, News. You can follow any responses to this entry through the RSS 2.0 feed. Responses are currently closed, but you can trackback from your own site.